Appearing recently on ABC's "The View," Senator Chuck Schumer painted a picture of Republicans unhappy with the their new president and getting ready to bolt for the door. "When you talk to Republicans quietly — you know — in the cloak room and the gym — they are having real problems with him. ... My prediction is if he keeps on this path ... within three, four months you're going to see a lot of Republicans breaking with him." Schumer could not be more wrong. He seems to have difficulty in distinguishing between the rumblings of change and the rumblings of dissatisfaction. After some 36 years in Washington, Schumer likes the way things are and probably cannot conceive how fed up so many Americans are and how they crave real and substantial change. Last year, on average, only 25 percent of Americans expressed satisfaction with the direction of the country, according to Gallup. It's been over a decade since this exceeded 40 percent. By any sober evaluation, America is going downhill. The economy is growing at an historically low rate; the national debt and deficits are growing as far as the eye can see; we spend more and more on public education with no change in test scores; poverty rates are static despite massive anti-poverty spending; the traditional American family is disintegrating; and America's role as a respected and influential leader on the global stage is vanishing. Sorry to be so gloomy, but this is the picture. Yet, despite this, we have a class in Washington, the Chuck Schumers of this world, who want, more or less, to continue business as usual. What is business as usual? Continue with big government answers to every problem, continue with the moral relativism that is wiping out our families, that has gotten us to where we are today. 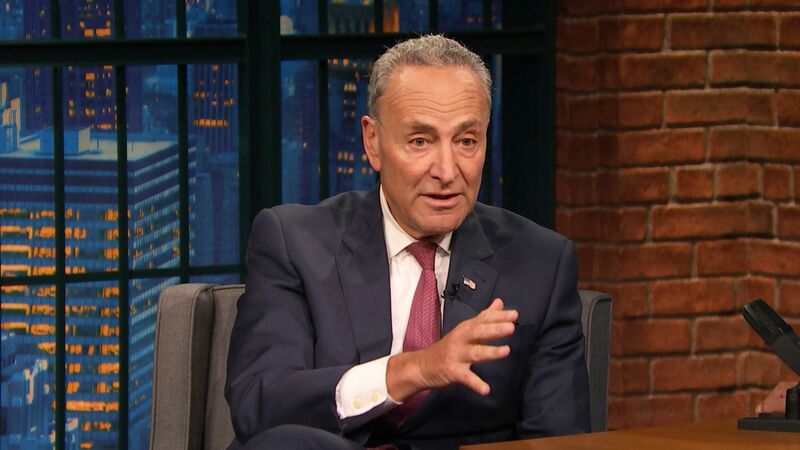 By Einstein's famous definition of insanity — doing the same thing over and over and expecting different results — Schumer might be deemed insane. In fact, Republican support of our new president is strong by historic proportions. According to a survey just released by the Pew Research Center, President Trump's approval rating among Republicans and those leaning Republican (84 percent) is higher than first year approval ratings of the last three Republican presidents — George W. Bush (82 percent), George H.W. Bush (82 percent) and Ronald Reagan (78 percent). President Trump's attacks on many revered institutions — our media, our courts — is not just some personal thing of his but a reflection of how many Americans feel. Recent Gallup polling shows that public confidence in the media (32 percent) and our courts (53 percent) are at all-time lows. The same Pew Research survey reports that 60 percent see President Trump as someone who "keeps promises" and 54 percent see him as someone "able to get things done." Maybe it's worth looking past all the noise for a moment to take a closer look at the vision and promises that Donald Trump served up in his inaugural address. Despite the deep divisions in the country today, Trump spoke about unifying the nation. "It's time to remember that old wisdom our soldiers will never forget: that whether we are black or brown or white, we all bleed the same red blood of patriots, we all enjoy the same glorious freedoms, and we all salute the same great American flag. "And whether a child is born in the urban sprawl of Detroit or the windswept plains of Nebraska, they look up at the same night sky, they fill their heart with the same dreams, and the are infused with the breath of life by the same almighty creator." No, Sen. Schumer. Republicans are not getting ready to bolt. Quite the opposite. The sounds you hear are the sounds of a great nation jockeying in preparation for a new chapter. What Abraham Lincoln, our first Republican president, called, "a new birth of freedom."